The month’s slip by, the bank account diminishes, your faith is tested and at times you wonder why did I start this in the first place? I’m sure there have been plenty before me, and more to come that will ask themselves that question when restoring a car or bike. The Nomad came home and sat in my garage for a couple of months which gave me an opportunity to wash it again, do a few small odd jobs and get a few other bits sorted. I have often heard of people “sorting” their car after it is built yet I seem to be doing a bloody lot of sorting during the build! First up was the fly by wire accelerator pedal. It didn’t work. Every time you change one thing, it has ramifications on something else. 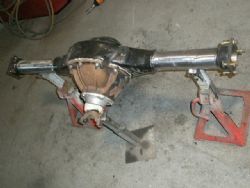 When we changed the engine wiring loom, the connector for the fly by wire accelerator pedal changed. Lets change the plug – wrong. Nothing. It idles but wont rev. In the E38 computer you can't map the accelerator pedal by software, it’s a hardware thing. S&P Performance in the US supplied me a GTO (read Monaro) pedal that we will find out tomorrow if it solves the problem. In earlier articles I alluded to Quickfit Motorsport (should that be Quickf**kup?) 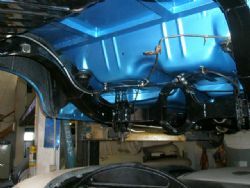 stuffing up everything except the rear end and engine mounts. That now just reads engine mounts. The rear end was completely knackered and it hadn’t seen a single kilometre on the road. I needed a professional outfit that knew how to configure a four link rear end properly. I asked around, spoke to plenty of people and through a reference from Paul at Procar we came across Customworks at Brookvale. 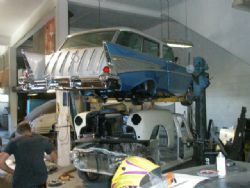 They have done plenty of suspension setups before and when the owner, Richard started talking about jigs, pinion angles and alignment I felt I was in the right place. He mocked up some templates in my garage for the new laser cut diff mounts and outsourced the job to a mob he has used in the past. He went on to explain the old diff needs to come out, all supporting brackets will have to be cut out, replaced, aligned, measured, squared and set up so it will handle and ride like it should. To minimise any potential dramas from his grubby workshop (due to his constant metal work) he wanted the nomad for no longer than a week and it would live on the hoist out of harms way. No problems from my end. True to his word the nomad was on the hoist for a week, the components were cut, massaged, welded, grinded, stripped and painted and the rear end is now back where it should be offering suspension travel, clearance and looking the ducks guts. Tomorrow is D day for the fly by wire pedal and some brake line work that we noticed was short of satisfactory and would have been bounced by the engineer. I wonder what is next?